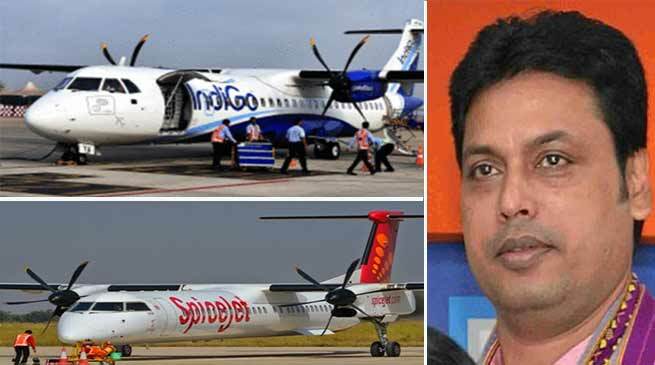 After reducing Value Added Tax (VAT) on aviation turbine fuel in Tripura, Chief Minister Biplab Kumar Deb on Tuesday wrote to Civil Aviation Minister Suresh Prabhu seeking a cap on fares for airlines operating in Tripura. “There is a sharp increase in airfares. The airfare from Agartala to Kolkata used to be around Rs. 2,000 earlier, which has now shot up to Rs. 13,000 to Rs. 15,000. In fact, on many occasions, tickets were not available at any price. As a result, even serious patients are not able to move out of Tripura. All the airlines, including Air India, are exploiting the common people of Tripura,” Deb wrote. Referring to the Civil Aviation Ministry’s Route Dispersal Policy (RDP) revision in 2014 and 2016, he said airlines have a mandatory obligation to operate 10 per cent of their capacity to remote locations including Northeastern states. Deb claimed that the crisis in air travel in Northeast India was caused due to airlines reducing their service in the region from the mandatory obligation of 10 per cent operation to 6 per cent. Some new states were also added in the list of remote locations, reducing focus on the Northeast, the Chief Minister wrote. After SpiceJet Airlines pulled out of Agartala in September, Maharaja Bir Bikram Kishore Manikya Airport now has eight IndiGo aircraft and three Air India aircraft flying on a daily basis. However, one of the Air India aircraft is reserved for the Army, para-military and other emergency services. Deb had earlier written to the central government in October claiming that IndiGo Airlines was enjoying a “monopolistic situation” at Agartala due to the withdrawal of operations by SpiceJet — which caused a sharp increase in airfares.